CyberKnife technology is the only type of radiosurgery that enables treatment of tumors and other lesions anywhere in the body, including both intracranial and spinal lesions. CyberKnife is the only system that has the capability to target a tumor’s true position within the body while treating the patient and even accounts for the changes in that position during respiration. CyberKnife is the most accurate radiosurgery system in existence that measures its accuracy down to sub-millimeter. Where standard radiation requires multiple treatments over many weeks, CyberKnife can achieve it in one to five sessions. Surgeons have much greater flexibility in treatment planning and can use smaller doses of radiation coming in from a variety of angles to better target tumors. Boulder Neurosurgical & Spine Associates (BNA) can treat tumors that were just recently considered too dangerous or inaccessible to a neurosurgeon’s scalpel and therefore inoperable. Due to the exceptional accuracy and capability to limit radiation to the surrounding tissues, BNA can even treat recurrent tumors that have already failed treatment with other types of radiation or surgery. Not too long ago we were offering our patients high-risk surgeries involving craniotomies, surgeries that require anesthesia, incision, long recovery time, and that were often associated with severe complications. Now we can confidently recommend this new alternative that is not only minimally invasive, but also virtually pain-free. 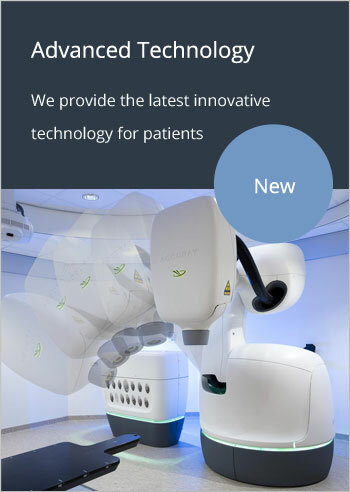 Click this link to read more about the advantages of the CyberKnife technology in neurosurgery.